A square is just a square until it becomes a house in this clever book. A circle becomes a spinning ferris wheel, and when you add some string and a tail to a diamond shape, it becomes a kite flying high in the sky! With sprightly rhymes and energetic illustrations filled with hidden shapes, Dayle Ann Dodds and Julie Lacome reveal that shapes are everywhere. 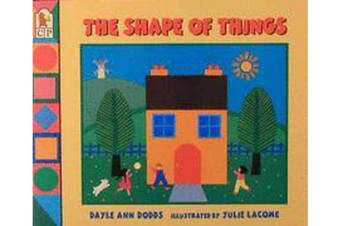 Encouraged by this entertaining introduction to an important first concept, young children will eagerly begin to identify shapes in the world around them.